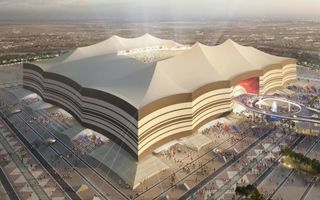 The Supreme Committee for Delivery and Legacy presented updated renderings of Al Bayt Stadium. First thing we noticed is the change in colour scheme. Instead of black, the roof will eventually be white. This update was done for practical reasons, reportedly. White PTFE should guarantee long-lasting quality. Though this material has been used before in Qatar and the wider region, tests are carried out now to establish how the membrane will withstand local climate. The next major change is space arrangement around the stadium. The precinct masterplan has been modified to fit more green areas including walking and jogging track, horse track, cycling track and family areas as well as playing areas for families in the inner circle immediately surrounding the stadium bowl. This will bring the car park to the outer perimeter, providing more spatial areas for the local community to benefit from. Currently the stadium has undergone all enabling works and first concrete works are expected to begin within the next 1.5 month. Complete structure, able to hold over 60,000 people, will be delivered in 2018 at a price of €770 million ($827m).